You would think super-caddie Steve Williams had climbed every mountain – as far as his career was concerned. Yet there is just one more goal, one more thing for the big Kiwi to strive for. And there’s no surprises for guessing it’s in his home-land. Williams would love to caddie for a player and get him home to win a New Zealand Open. And he hasn’t ruled out doing just that, despite living in semi-retirement at the moment. Despite staying right away from the limelight as far as tournament golf is concerned in recent months, Williams will make a guest appearance at New Zealand’s biggest golf event when it takes place at The Hills in Arrowtown, deep in the South Island next month. “It’s a tournament I have always held dear and I’d love to caddie for the winner of my home Open,” said Williams. 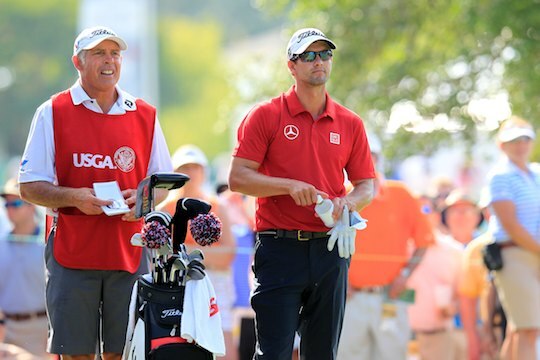 Williams has ruled out caddying for some lucky player at the Open as he has a prior family commitment and since his retirement as Adam Scott’s caddie he has decided family comes first. Williams will host a pre-tournament clinic for all caddies on March 11, then spend the first and second rounds of the open caddying for an amateur. All amateurs will have the chance to bid for the experience, with proceeds to go towards tournament charity The First Tee and the Steve Williams Foundation. “I’m looking forward to getting down there and helping out,” said the big fellow.